From the creator of the award-winning Slow Home podcast comes Slow: the perfect companion on the long road to living a simpler and more fulfilled life. Once upon a time, Brooke McAlary thought she was close to having it all. Married to a wonderful man, mother to a lively young daughter, and pregnant for a second time, she’d acquired all the things she’d once thought important-holidays, cars, a renovated home. Yet despite this, she found herself utterly despondent. Realising that they wanted a simpler, more fulfilling existence, Brooke and her family gradually created their own way of living, with an emphasis on depth, connection and experiences. 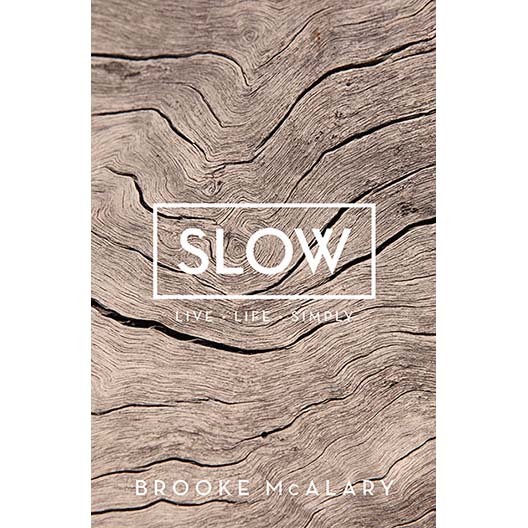 In Slow Brooke gently encourages you to find pleasure and value in a simpler life, sharing the practical tips and rituals that have helped her on her own journey, from decluttering to de-owning, messiness to mindfulness, from asking why to asking where to now? Part memoir, part practical companion, Slow provides a fascinating insight into the benefits of slowing down. It will inspire you to forget about the Joneses and create a life filled with the things that really matter to you… slowly, of course.